Whether you are going on a short weekend getaway camping with friends or embarking on an expedition, you should definitely consider the luxury of hot food and drink to ensure your trips will be more enjoyable. With the plethora of more ambitious and affordable camping stoves out there on the market today, choosing the best portable stove for your needs can be quite daunting. Well, we have narrowed down the choices to make this task easier for you. Built with combined stainless steel and aluminum alloy, this stove is considered as one of the lightest and most portable on the market. With a carrying case included in the purchase, it has become more portable, as it can simply be tossed in a bag without worry. Aside from its high portability, it is also quick to ignite and consistently strong with its Piezo Ignition system that allows it to have a quick ignition and a strong valve connection that ensures flame would stay consistent and strong, even when set from high to low. 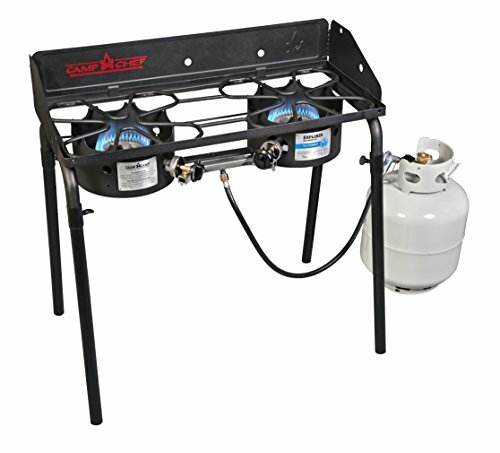 Moreover, this stove produces a very fuel-efficient flame that can make a disposable butane canister last for days and can accommodate for up to a 7-inch diameter pan. However, there will be a few downsides to using a stove like this, such as the height, which is quiet tall when put on top of a fuel canister. Take note that an 8-ounce can is roughly 4 inches high, and with this stove being 3 inches in height, finding a heat shield might be an issue. Another issue would be the igniter probe, which is a bit wonky, even seeming that it would break. Nevertheless, all the pros make this a good contender as the best portable stove for any camper. Design is one of the most important things to look into when finding the best portable stove, and it is true with this one from Coleman—it is even very easy to set up. Its gas feed tube is just screwed onto the gas cylinder and then into its right side. However, it only makes the squat 16.4-ounce tanks to be usable, but it is possible to obtain an adapter and hose to run the stove from refillable tanks. Also take note that the proper disposable tank does not fit into its cabinet for travel, so you must carry the fuel cylinders separately. This may be a real issue if you are looking for maximum compactness. Throw-away cylinders may pose a problem if you are carrying the equipment to remote regions where there is no trash-pickup service. You can easily light this stove with a match or other lighting devices. This is a remote canister stove that is lighter than most sit-on-top stoves. As such, it sits lower to the ground and is more stable when you cook with bigger pots. Also, it is more efficient, as it can be fitted with a copper block valve and a metal mesh gas line. Its valve is designed for precise adjustments of flame for outdoor cooking and fits common screw-on valve canister fuel of butane or butane-propane mixtures. When it comes to convenience and safety, this Dpower stove is foldable and ultra-light, which means it is easy to carry, and is safe and easy in terms of changing canisters during cooking, with its 11-inch stainless steel mesh gas pipe. The stove also sports an anti-slip design that can accommodate up to a 30-cm diameter pan in a sturdy way. 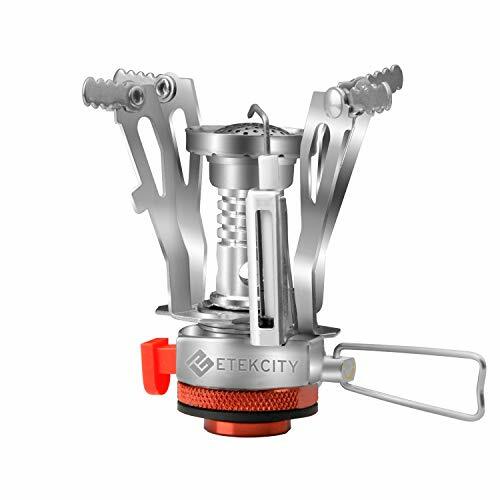 While all its features seem to make for the best portable stove, it is important to know that some users had concerns of its hose coming lose or degrading over time, since it does not appear to be removable. Also, the flame would not perform well in the wind, which is normal for this type of stove. Like any other portable stove, this burner is there for you whether you are cooking outdoors or needing a way to fix a meal in an emergency. With strong performance capabilities, this contender for the best portable stove is considered as a true outdoor appliance, with a 3-sided windscreen to shield the breeze to come your way and a single 20-pound tank that can keep it going for 15 hours. However, the front, center and angled-down location of the MIP fitting is in an awkward place it could be. Typically, users are going to have the tank to the rear or side, so they can have a fitting location aimed in a direction that makes sense. As for its build, the hose is subject to getting spills on it and having a side strain from trying to locate it to the aft or side or aft. Furthermore, the burner valves are exposed to cooking spills, but a metal shield can help solve this issue. The durable burner stove from Coleman has powerful burners that allow for great cooking performance—it boils water very quickly as it allows you to adjust the temperature from simmer to a boil. Its large cooking area can fit one 10-inch pan and one 12-inch pan, and its PerfectHeat Technology gets the temperatures just right. For windy environments, this stove can still perform well with its WindBlock Shields, which keep the wind from blowing the flames, and its PerfectFlow Pressure Control System, which keeps the heat steady on each of the high-performance 11,000-BTU burners. The Triton is also efficient with a 1-hour runtime on high using a single 16.4-ounce propane cylinder. It features a slim and portable design, so when you are done, it is easy to clean and keep. 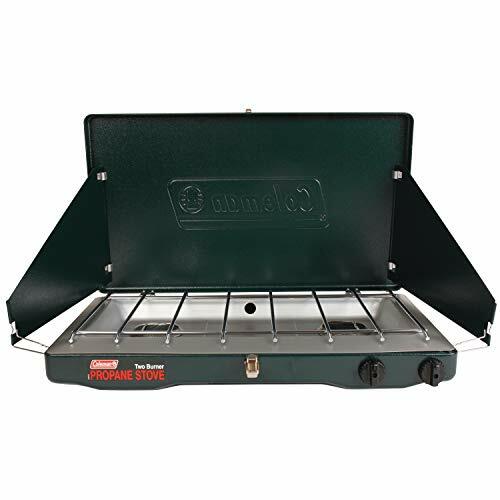 This is made much easier with its removable heavy-duty, nickel-chrome grates and its built-in handle that will have you carrying this lightweight stove effortlessly. Adding its durable steel construction that can withstand rugged cooking conditions, this stove is definitely perfect for camping, tailgating, hunting and during emergencies. The only thing that seems to be missing is the instant-start ignition button, which means that you have to spend more to get another model with such feature, the Coleman 2000012034 InstaStart Triton Stove. Optional griddle accessory packs away inside stove are sold separately. There is a lot of reasons why these products can be considered as the best portable stove for a weekend getaway, including compactness (the most obvious), reasonable price tags, minimum carbon footprint and additional components that would prove useful in any camping environment.